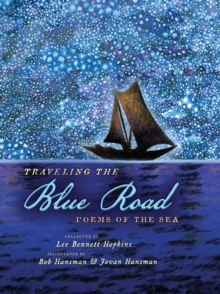 A 2018 Notable Poetry Book for Children (National Council of Teachers of English) Selected for Notable Social Studies Trade Books for Young People 2018 by NCSS-CBC, a cooperative project of the National Council for the Social Studies and the Children's Book CouncilTraveling the Blue Road is a carefully curated collection of kid-friendly poetry about the ever inspiring subject of the ocean. Themes include pilgrimages, migration, culture, and more. Prepare to be inspired by the sea with Traveling the Blue Road. This book is packed with gorgeous illustrations that surround a collection of poetry for children on the themes of the courage, beauty, and promise of sea voyages. Compiled and edited by award-winning poet Lee Bennett Hopkins, the poems describe how the sea has historically shone as a metaphor for both hope and despair, and served as a pathway for people searching for new life. Traveling the Blue Road includes poems about the pilgrims coming to the New World, the Mariel boatlift, the Vietnamese boat people, a Dutch slave ship, the current migration situation in the Mediterranean, and the voyage of the St.
Louis. Contributing poets include Rebecca Kai Dotlich, Paul B.
Janeczko, J. Patrick Lewis, Allan Wolf, Marilyn Nelson, Denver Butson, Georgia Heard, Jane Yolen, Naomi Shihab Nye, and G.
Neri, and Margarita Engle, the recently named Young People's Poet Laureate. Named one of Bank Street College of Education's Best Children's Books of the Year, 2018!